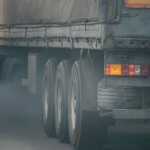 Several technologies are used for dealing with toxic diesel exhaust fumes. None more significant than a diesel particulate filter (DPF). The in-line exhaust device traps soot, ash, and other particulates in a cell membrane. A DPF must be cleaned periodically, or extreme pressure develops and restricts engine performance. Most diesel engine builders incorporate active, passive or manual regeneration methods to curtail the soot buildup. Operators also employ cleaners and additives to promote efficiency. In this article, we will take a deep dive into discussing what are the best DPF cleaner products on the market today. What to Look for in a DPF Cleaner? DPF cleaners are chemical treatments which serve to reduce soot and particulate emissions in cars, SUVs, light to heavy-duty trucks. During a regeneration cycle, a considerable amount of carbon residue is burned off. However, there is a significant volume of burnt ash that remains trapped in the honeycomb substrate. Diesel operators know first hand the advantage of preventive maintenance. Regular stops to a mechanic for DPF cleaning is always a good idea. Large fleet managers will invest in DPF cleaning machines along with a dedicated workforce. Experienced operators should devote the time and money in learning how to clean a DPF. 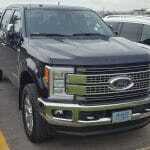 Light-duty trucks and passenger vehicles should use DPF additives regularly. Many of the following DPF additives can be acquired in bulk for high mileage operators and fleet service. It is always an excellent idea to analyze a brand and stick with the company for the life of your diesel engine. 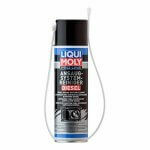 Liqui Moly is a global German company producing a broad line of diesel specific additives. Liqui Moly has an outstanding reputation for delivering quality lubricants, additives, repair and service products. The DPF cleaner can be utilized for passenger and commercial vehicles. Note: It doesn’t work with electronically controlled additive tank system such as those made by Citroen or Peugeot. 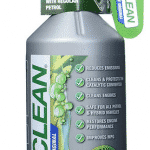 This cleaner will break down most contaminants and is effective for Cummins and Duramax diesels. Liqui Moly has decades of quality products for diesel engines. You will need to purchase the add-on product Liqui Moly DPF Purge Fluid, for the process to be complete. Consider buying the spray wand and tank at your local hardware store and save money. 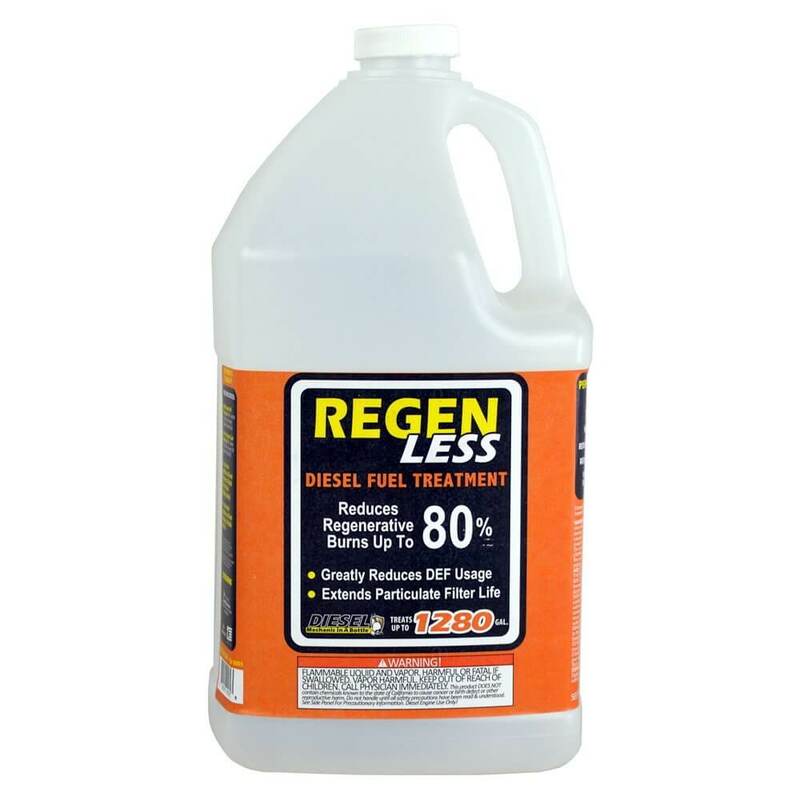 The regen-less diesel fuel treatment is a fuel additive that reduces injector stiction, increase diesel particulate filter life, and reduces regeneration cycles by up to 80%. It is compliant with ultra-low-sulfur diesel fuel and can even work on trucks using bio-diesel. One gallon of regen less will treat up to 1280 gallons of fuel. 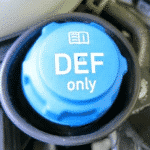 Furthermore, it reduces the truck’s reliance on the diesel exhaust fluid. It is also available in a 24-ounce bottle. It is a great way to minimize soot collection and contamination while preserving the life of your DPF. This product is specifically made for diesel particulate filters and is an additive that you pour into your fuel tank. While the vehicle is in operation the additive works with the fuel mixture to safely and thoroughly clean the DPF. It is a great preventative maintenance tool. Furthermore, it is easy to use and formulated to prevent the creation of secondary pollutants. Must-have for diesel truck owners. Cutting edge technology for diesel engines. One product improves the overall operation and alleviates regeneration stress. Too pricey for fleet use. Keeping a DPF clean is a fact of doing business for large fleets and aggressive long-range, heavy-duty operators. Fluids such as fuel, oils, and DPF cleaners are all acquired in volume to curtail costs. Getting the DPF cleaner and additives to the truck or other equipment must be dealt with effectively. 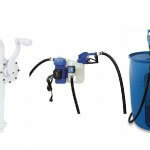 Initial costs for dedicated DPF cleaning machines can be pricey. 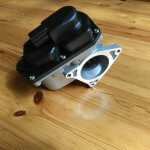 However, the increase in performance is immediately established for a diesel engine. Kline Specialty Service Tools has been in business designing OEM equipment for over 60 years. The business services several distinct industries. This DPF Cleaning Machine is for high volume fleet management. The machine is quick, portable and a complete system. Kline cleaning technology concentrates on DPF cell membranes with forced air. 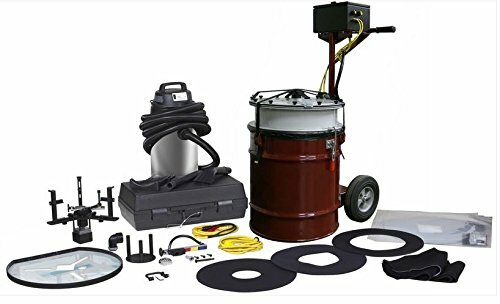 Cleans filters with diameters of 170 mm to 400 mm (6.6 inches to 15.7 inches) Large equipment companies have identified this system as the most productive to use. Complete setup includes various nozzles and fully automated. Good support and plenty of add-on accessories to expand. Way too expensive for individual use. 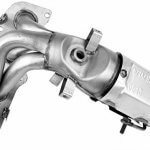 Q: Do DPF cleaner additives work? A: DPF cleaners are chemical solutions added to a fuel tank, with some performing other processes. Choose a DPF cleaner which reduces the temperature of soot and ash. DPF catalysts do not raise the temperature of the filter itself during regeneration. Q: How to use DPF cleaners? A: DPF cleaners/additives can be added in a couple of ways. 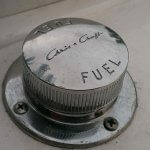 A fuel additive processes directly through the engine. (empty the fuel tank as much as feasible, add the cleaner, fill the tank.) Cleaning a DPF attached to the exhaust is more involved. Purchase a good wand and tank from your local hardware store. Add the cleaner as recommended. The DPF filter should have a panel providing entry to the cell membrane. Clean the filter to spec and dispose of excess soot and ash. 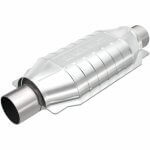 Q: Cleaning DPF with oven cleaner? Does it work? A: Expert advice is always to seek out diesel mechanics familiar with the process of cleaning a DPF. Oven cleaner, gas and paint thinner could weaken the filter beyond repair. A DPF is not a cheap piece of needed equipment. Mechanically inclined operators can apply materials which carry out the process easier. Professionals advise using fluids explicitly created for diesel engines. Further reading can be done here. The DPF collects the soot produced by burning diesel fuel. When the soot builds up, the Electronic Control Module starts the regeneration system, which burns up the soot and circulates the air back through the system. In some cases, this regeneration cycle is not triggered properly. This leads to computer errors causing the vehicle to shut down, clogged Aftertreatment Regeneration Device (ARD) heads, low back pressure leading to lack of proper filtration and fluid dilution, and other potential problems. The most common sign that the system is faulty is that the ARD head gets clogged. When that happens, the truck has to go into the shop, the ARD head must be removed and cleaned out or replaced, and the computer must be reset. 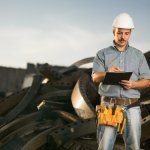 Depending on whether you need a new part, and whether the nearest authorized service location has the part, you can lose significant time to this repair. An electronic control module is supposed to detect soot buildup and add a precise amount of fuel to oxidize the soot. Early engines with this package have experienced significant problems, leading to excessive down time, missed deadlines, tow costs, repair costs and a host of other negative consequences for their owners. While undoubtedly meeting EPA standards, the engines with this configuration have experienced numerous problems and cost the owners and operators of these trucks significant time and expense. In many cases, the ECM would fail to detect soot buildup and the truck would simply shut down. In other cases, clogged ARD heads would require frequent replacement. The products reviewed in this guide to DPF cleaners are intended to help you prevent reaching such a stage of repair. Use them often and follow the instructions on the labels for maximum effectiveness. Keeping a diesel particulate filter clean and in top condition demands the correct machinery and fluids. Do not entrust a diesel engine to any fluids other than what has been produced for a diesel engine. There are plenty of cleansers and additives on the market from reputable companies. Additives may take a few treatments for the burn-off process to work. However, spending $30 to 60 dollars every few months is much smarter than replacing a costly DPF unit. Research the best DPF cleaner for your diesel and remain with the brand.